I’ve been eating kozhu katta for as long as I can remember. My grandmother used to make it pretty often as an after-school or evening snack. I would gobble them up real quick, and never really bothered to understand what went into preparing them. So this month, when I went home to Kerala to visit family, I went into the kitchen for a one-on-one tutorial. These steamed rice dumplings are versatile, and make a great breakfast or snack. I have always eaten them with coconut or mango chutney, but they taste great by themselves too. Katta in Malayalam means lump, so the name aptly corresponds to the shape of the snack. I do not really know the history of the name; my bloggy friends who have a clue, comment away!! 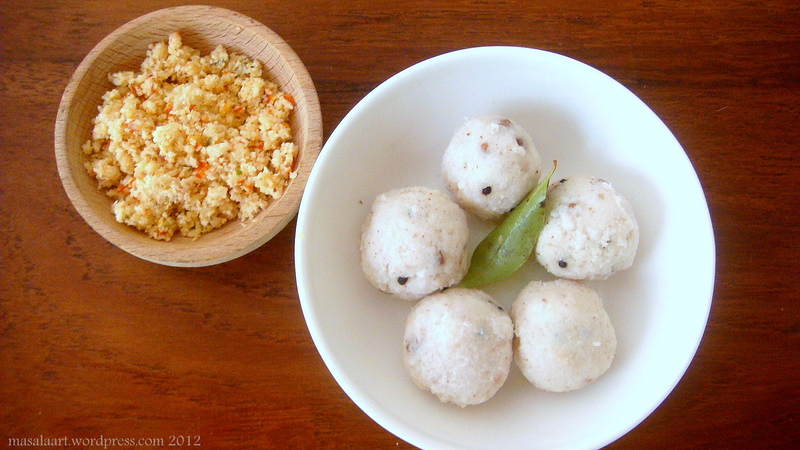 There are two kinds of kozhu katta, sweet and savoury. 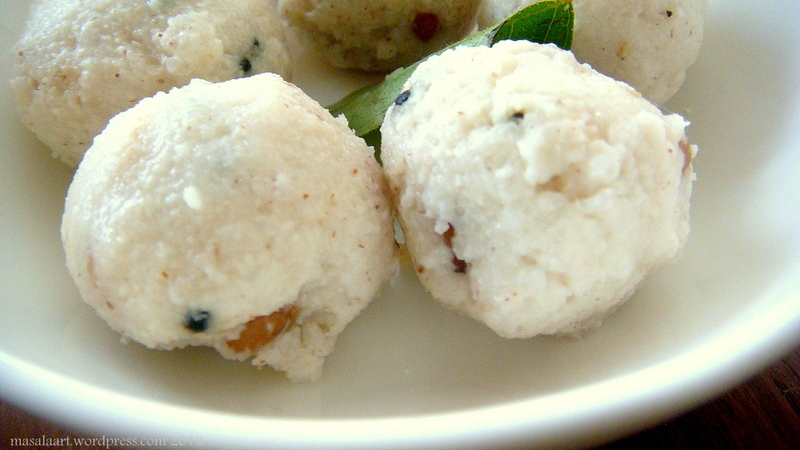 The sweeter version, filled with jaggery and coconut, resembles a dimsum and is made especially during Ganesh chathurthi. (It can be made year-round as well.) It’s called modak in the state of Maharashtra. Both versions are usually filled with something, sealed and then steamed, but this one is not. The dough is mixed in and cooked with tempered spices and then steamed. My knowledge about this snack is a little sketchy, so let me not embarrass myself further and get down to the recipe! Anyway. Most recipes call for rice flour, but I followed my grandmom’s version which is a little more painful- you have to soak the rice overnight and then proceed to grind it. She also uses equal amounts of coconut and rice, to give it a nice grainy texture. And hey- I come from the land of coconuts. Coconutty= better. In a blender, combine soaked rice, coconut and just enough water to make a paste and blend to make a pancake like batter. Not too runny, not too thick. In a large wok, heat the coconut oil. When it gets hot, add the mustard seeds and black gram, followed by the curry leaves and crushed chilli. Pour the batter into the wok, and stir it around so it gets coated evenly and cooks. Let things bubble and simmer, and make sure you stir continuously to avoid lumps. Cook till the water disappears and the dough leaves the sides of the pan. You do not want to get the dough too rubbery. It should not be sticky, but smooth enough to knead gently. Now, take the dough out of the wok, grease your hands with some oil and knead gently. Tear off one-inch pieces of the dough and mould into little balls. Place in a steamer for about 8-10 minutes. There are several other recipes which call for the dumplings to be steamed, and then tempered separately in a wok before serving. I have followed this method because this is the way my grandmom has been doing it for years. Plus, when the dough cooks in spicy tempered water, it absorbs the flavour much better. The first time I made it, I added too much water and the dough just fell apart and stuck to the bottom of the pan. The second time, I cooked it through and the dough got too tough sitting in the wok. Things can also differ with the kind of rice that is used- some varieties require more water and some less. I know all these comments will put several home cooks off- but it’s just my way of saying that this is one of those recipes that may not be all perfect from take one. You can eat this as is, or serve it with chutney like I have (I made a mango chutney.) I’ll share the recipe for the mango chutney in my next post! I am bookmarking this… I really want to experiment with these! Missing Kozhukatta’s very much! I must ask our Toronto Kerala Restaurant to add them to the menu! Maybe you can teach them how. Have a kozhukatta and tiffin service in the afternoons! Does Arundhati like them? Yes, Arundhati does love them very much! Never knew there was a savoury variety too… I am definitely trying these out next time I am home… they look yummy! I didn’t know they were called that in Hyd! So many memories attatched to traditional dishes, no? Oh, my goodness. These look so good! “Painful” or no, I think your grandma must have it right. Haha! Thanks. I just feel that with each generation of women in my family, the patience levels in the kitchen diminish by 20%. Min. kozhu katta are my favorite mallu food!! The yumminess. I would actually like eating them with chicken curry. Is that weird? I can’t believe I never knew that!! OMG. Ok so as soon as you get back, it will be kozhukatta and chicken curry. I think every tam/mallu child has a kozhukatta story.